Chances are you have a named instance for your SCCM SQL install, which is definitely the way to go. However, when installing SCCM 2012 (R2) you are presented with the following error. To resolve this is pretty pain-less. First, to Enable Named Pipes, Launch SQL Server Configuration Manager, expand the SQL Server Network Configuration. Locate your named instance, right-click on TCP/IP and enable. 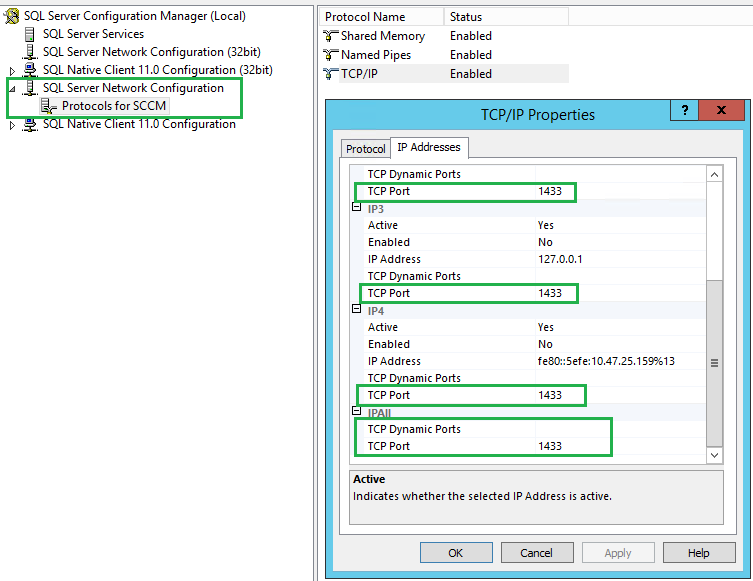 Second, within the same console view, double-click and open the TCP/IP properties. Here you need to delete any 0‘s (Zero’s) assigned to the TCP Dynamic Ports (Yes, remove for all IPv4, IPv6, IPAll, etc.). Also within the IPAll there will be a random port assigned here (TCP Dynamic Ports), go ahead and delete this too. 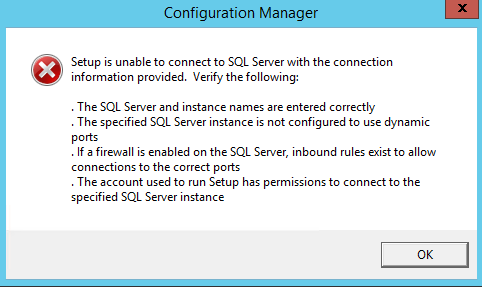 Once you have implemented the two solutions above, now go ahead and restart the SQL Server (instance name) service. Now proceed with your SCCM 2012 R2 Install. If you want to learn more on Configuring SQL Server and TCP Port(s), please see the following Microsoft article, HERE. You are very welcome! Glad the post could help. Thank you! My problem was disabled Named Pipes. I’ve tried all of the steps mentioned but I’m still getting the same error. I’m running Server 2012 system in a VM environment and I’m trying to setup SCCM as a test environment at home. They’re other sites with various configuration settings but I’m still having the same issue. Is there something else I’m missing? hi, are you getting the same error? have you restarted the sql service(s)?